Two summits along the scenic drive through Lassen Volcanic National Park are reachable by trail; Lassen Peak, the highest point for many miles around, and Brokeoff Mountain, which at 9,235 feet is over 1,000 feet below Lassen though offers similarly spectacular views, and requires a longer hike with greater elevation gain, since the trailhead is lower. The mountain is a remnant of ancient Mount Tehama, now forming part of the rim of Lassen Caldera, and so named because of its very steep north face, the remainder of which was sheared off by long-ago glaciers. 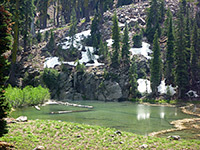 The path encounters a range of scenery, more varied than on Lassen Peak, including talus slopes, floral-meadows, woodland and a stream with pools. Both routes are only open for a few months in summer, due to deep snow at other times, but the Brokeoff Mountain Trail is less subject to the frequent maintenance that often temporarily closes Lassen Peak. Lassen Volcanic National Park map. 13 views along the Brokeoff Mountain Trail. Panorama from the summit of Brokeoff Mountain. Full screen version (13 mb). The path to Brokeoff Mountain begins at a parking area on the east side of Hwy 89, shortly before the southern national park entrance station, and so can be reached without payment. This point is accessible all year since the road is plowed as far as the visitor center. The route is one of the most popular even though many people do not hike the full distance. The trailhead overlooks an unnamed stream, a tributary of Mill Creek, which descends a valley on the southeast side of the mountain, running alongside the lower 1.5 miles of the path. 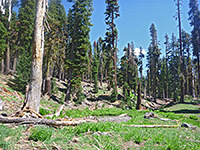 The hike starts by crossing a moist, overgrown, bushy area with plenty of summer flowers, then enters light pine woodland. The stream flows through a mix of grassy meadows and patches of trees, over ground that is quite steep in a few places, resulting in short cascades, but nearly flat in others, where the creek spreads out into shallow pools. The trail crosses the stream after a while, and climbs some more through thinning woodland, out to a viewpoint on a stony knoll, and then, after a few switchbacks, reaches an open, V-shaped valley at the upper end of the creek, a place that gives the first good views of the summit, still 1,400 feet above. The ascent continues on the right (north) side, before the path crosses to the left and has more steep zig-zags through sparse forest, slopes which often retain deep snowdrifts well into August. The ground becomes rockier, rising up to a thin ridge formed of large, jagged boulders allowing long distance, 180° views of lands to the south, from Lake Almanor across to the Central Valley. The top of the mountain seems quite close now, rising above treeless slopes. A long switchback leads northwest over earth and scree before the final turn eastwards, across more rocky terrain to the small plateau on the summit. From here, the panorama extends over a hundred miles west to the Coast Range, usually topped by fog; in other directions most of the land is endlessly wooded and undulating, but with a sprinkling of higher peaks of which by far the most prominent is Lassen Peak, 4 miles northeast (see panorama). 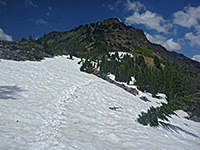 The rocks on the summit are variously brown, red and black in color, reflecting their volcanic origin, and are exposed all down the very steep north face of the mountain, which contains narrow ravines harboring snow nearly all summer; semi-permanent ice split by turquoise blue crevasses.